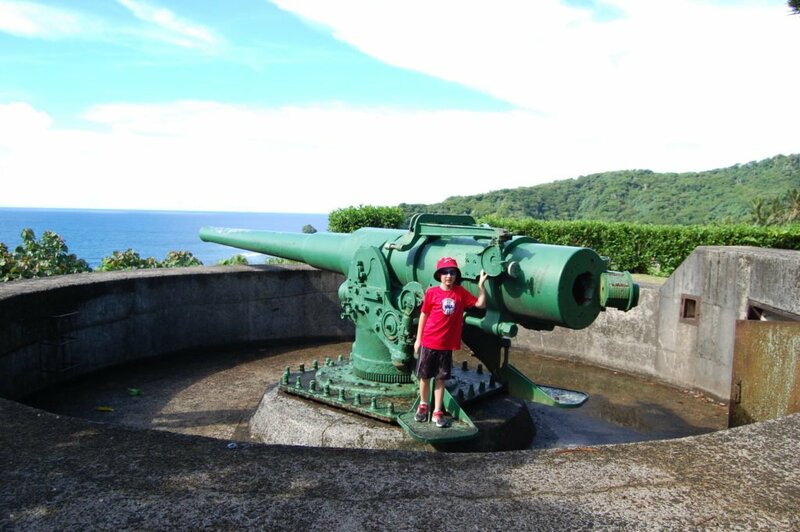 Before we moved to American Samoa, one of the things that Boston wanted to do here was to hike Blunt’s Point to see the World War II guns mounted at the top. 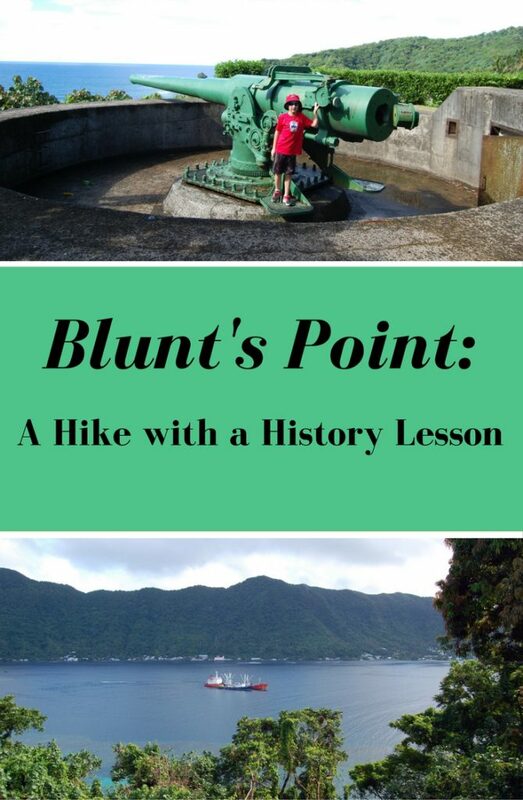 So, naturally, our first hike after moving here was Blunt’s Point. 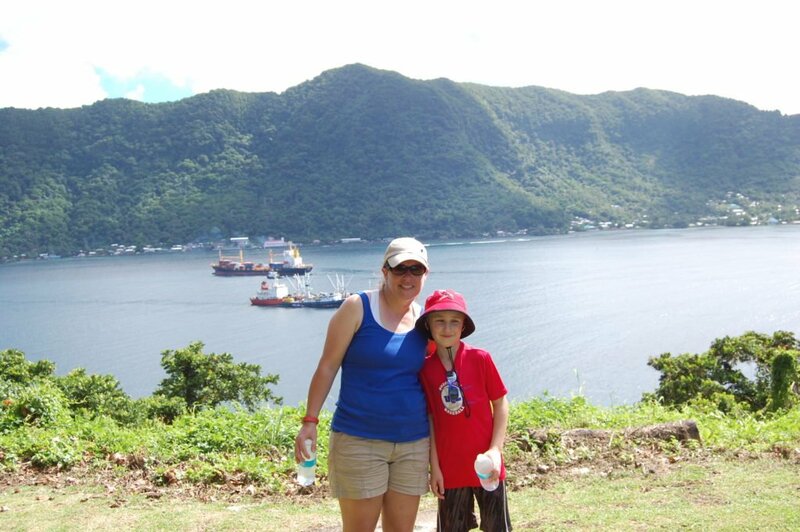 We did this hike on our second day on the island. This was a great first hike for us. I’m sure that we will hike this trail again many more times during our days on the island. This is the story of our first hike up Blunt’s Point. 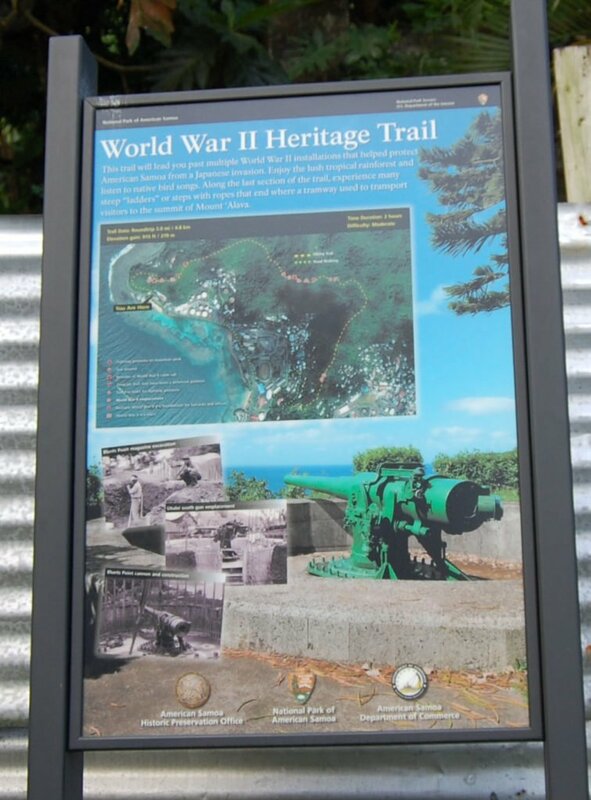 The sign at the trail head of Blunt’s Point detailing some of the WWII history of the island. After Pearl Harbor was bombed in 1941, the United States Navy installed two guns atop Blunt’s Point. 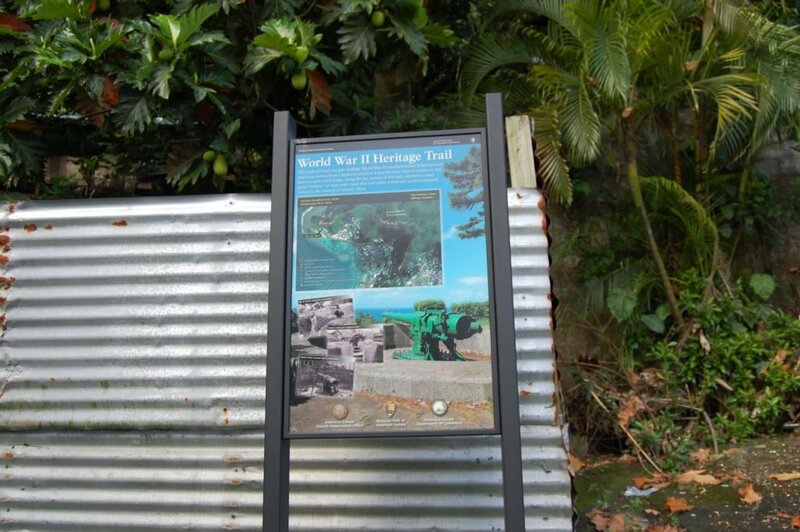 These guns were put in place to protect Pago Pago Harbor from a potential Japanese attack. The guns had the ability to fire six-inch rounds up to nine miles away. Because of the narrow ridge, the guns were placed one behind the other. One is a little higher up the ridge than the other. The guns, which are still in place today, serve as a hands-on history lesson. The lower gun is listed as a National Historic Landmark and is on the National Register of Historic Places. The sign at the trail head. On our first day on the island, our neighbor pointed out the trail head to us during our drive along the coast. I made a point to take a mental picture of the location so I could find it again later. The trail starts next to a small laundromat across the street from the coast between the villages of Faga’alu and Utulei. There is nothing else at this location but the laundromat. Only a small sign designates the beginning of the trail. The next day, we took the bus back towards the harbor. I wasn’t exactly sure how far it was to the trail head. All I knew was that I would recognize the small laundromat when I saw it. So, I kept my eyes peeled during the bus ride. When I spotted it, we pulled the string signaling the driver that we wanted to get off. I was more than pleased with myself for being able to get us back to this spot without any help. The beginning of our hike to the lower gun. After reading the small sign at the trail head, we headed up the mountain. We weren’t sure how far it was to the guns, how steep the hike would be, or how long it would take us. 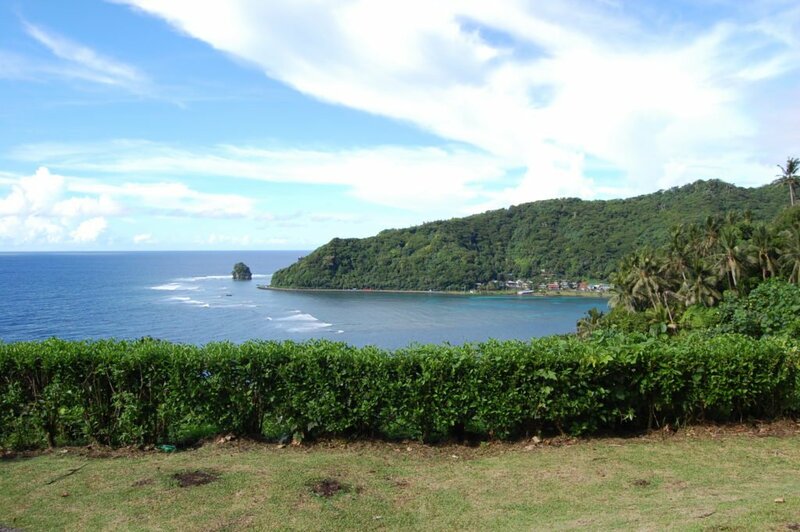 Truth be told, prior to coming to American Samoa, we were not the outdoorsy, adventurous type of family. In fact, this was the first hike any of us had ever done. We were all in regular tennis shoes and had no emergency equipment with us other than a cell phone and some bottled water. We headed out anyways, excited to be on our first hiking adventure on the island. Luckily, there is a well marked trail that was pretty easy to follow. After a few minutes, our calves were burning, but that soon subsided as we got into our groove. Soon enough, we reached a large water tank. We stopped at this point because it appeared the trail just ended. After a few minutes, we realized the trail continued along the side of the tank. We continued following the trail, and before long, we were at the lower gun. 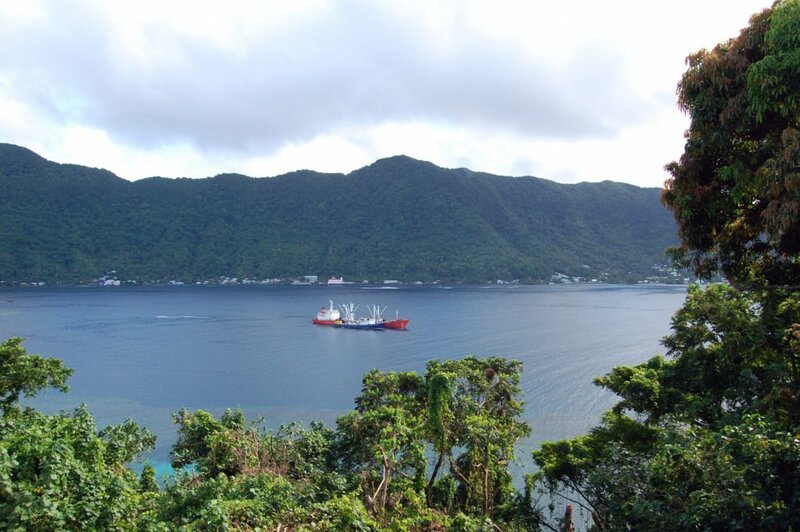 The view of Pago Pago Harbor from the lower gun. The lower gun is placed in a clearing with a gorgeous view of the harbor. It’s easy to see why the gun was placed where it was. We stopped here for a while. Chris and I enjoyed the view while Boston enjoyed examining the gun. After a few minutes, we headed on up the trail to the upper gun. The view looking the other direction from the lower gun. Boston checking out the lower gun. The two guns are not too far apart. However, the trail grows steeper after leaving the lower gun and continuing up the ridge. When we reached the upper gun, we were all a bit surprised. The view from here is pretty much nonexistent. It appears that the rainforest has grown in and covered the view from the upper gun since the 1940’s. The clearing here is also much smaller than at the lower gun. Boston and Chris in front of the upper gun. After stopping for a bit so Boston could examine the upper gun, we decided to continue on up the mountain trail a bit. We knew from reading the sign at the trail head that the trail would get much more challenging beyond this point, but we decided to test it out. At first, it wasn’t too bad. It was definitely steeper and more difficult than the trail to the lower gun had been, but nothing we couldn’t handle. After a while though, we decided to turn around and head back down. The path became much harder to navigate and Boston was getting tired. Chris and I decided that it wasn’t worth risking one of us getting hurt to continue on further on this first hike. The hike up past the upper gun was quite steep. Aside from a couple of spots, the hike back down the mountain was pretty easy. We stopped again at the lower gun to rest for a few minutes. Boston threw a fit to stop army men here. However, there were some other people there trying to have a quiet meditative moment, so we told him we would bring him back to play another day. We continued our hike on down. By the time we reached the laundromat at the bottom, we were sweating and tired. It had taken us about an hour or so to hike approximately 1 mile total. We then caught the bus back home. Boston and I at the lower gun. Blunt’s Point is a great hike, even for beginners like us. If you are out of shape, I recommend taking it slow, stopping when you need to rest, and only hiking up to the lower gun. The view from the lower gun is outstanding. Both guns are identical, so you won’t miss out on anything if you stop at the lower gun. It’s not often that you get such an up close look at a piece of American history. It’s easy to imagine what it was like for the soldiers who were stationed here and manning the guns during WWII. 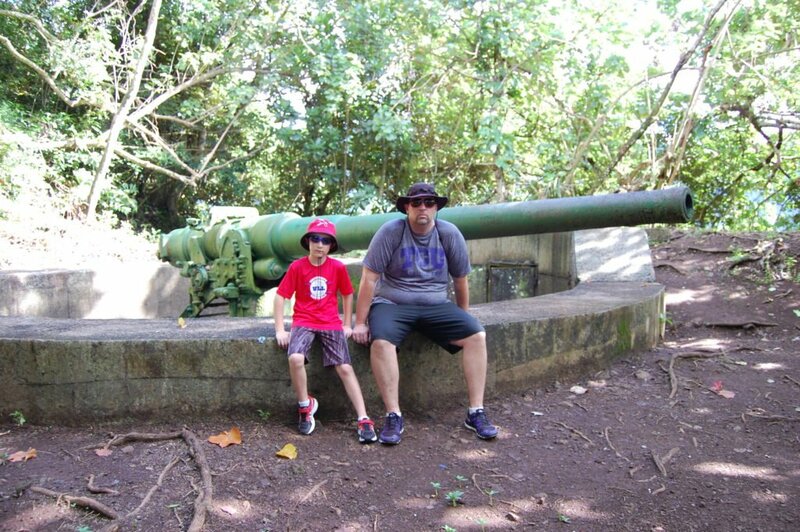 A hike to the guns is a great way to teach your kids about history and get them interested in studying the past. Boston had no troubles making the hike up the mountain to see the guns. 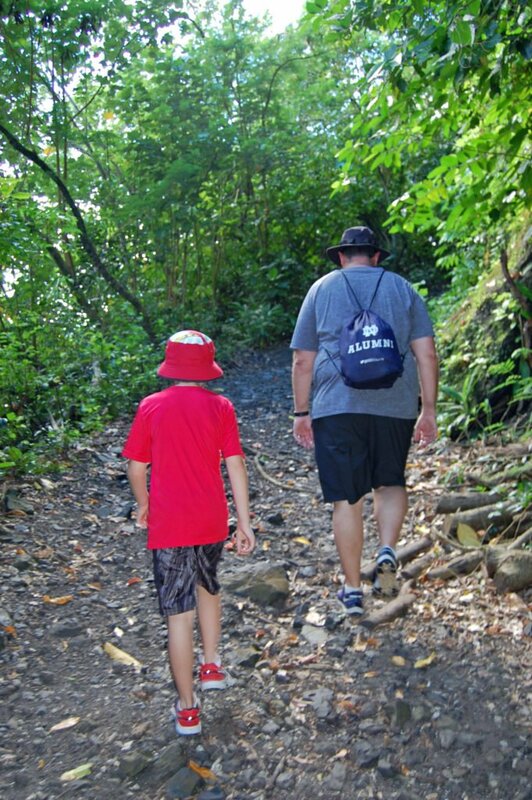 I would say that even children as young as 4 should be able to conquer this hike. 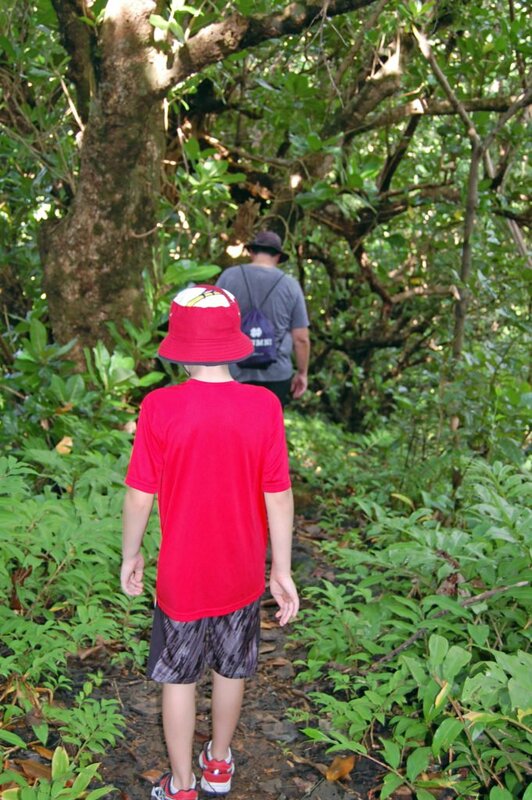 If you have boys, this hike is a must-do for your family during your visit to American Samoa. Happy travels! Don't miss out on your chance to take the stress out of packing for family vacations. 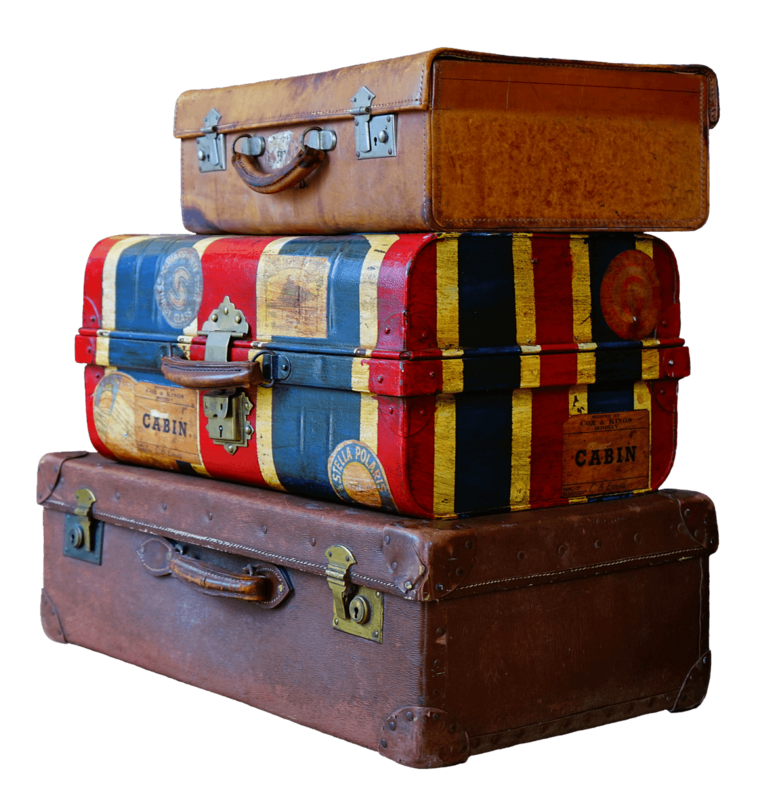 Subscribe to our weekly newsletter full of more travel tips and download our free packing list!